Strong, hard wearing 1" wide polypropylene web with elastic insert. Roko buckle attachment and swivel trigger clip fastening. 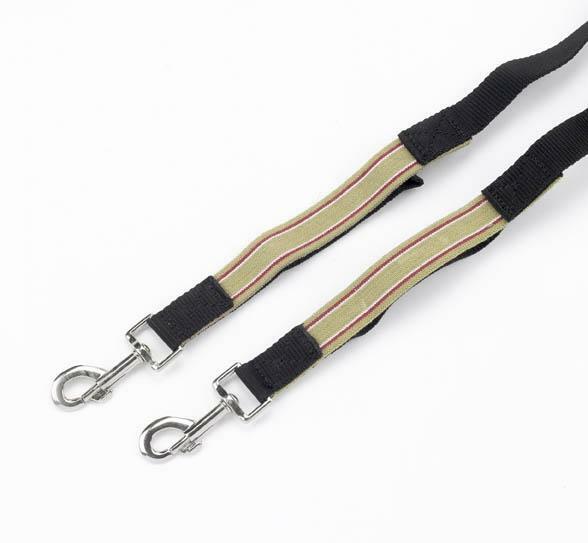 The reins are adjustable and the sizes shown are the approximate lengths that they can be used at. Below are some recent questions we've received regarding Hy Elasticated Side Reins, including answers from our team. Do these side reins have clips at both ends? Please be advised these side reins have a trigger clip as seen in the image and a buckle on the other side allowing the reins to be fastened to the saddle or lunging surcingle. The reins are adjustable and can be used at lengths between approximately 65 - 118cm from the clip to the end of the rein. The Elasticated side reins you have for sale, what size do they come in? I'm looking at them for my Cob. The reins are adjustable and can be made to a length of approximately 116cm, up to the end on the clip.